The concept of the “V” model was originally developed by NASA in the 50s. Its application within aerospace was related to the fact that “everything had to be created from scratch, or commercial products had to be adapted for use in an environment for which they were never intended to be used” (Forsberg and Mooz, 1998). Therefore, the model was conceptualised for solving problems related to reliability and performance e.g. the 12 failures in launching the Corona satellite (Forsberg and Mooz, 1998). “This depiction [the ‘V’ model] is requirements-driven, and starts with identification of user requirements. When these are understood and agreed-to, they are then placed under project control, and through decomposition the system concepts and system specification are developed. The decomposition and definition process is repeated over and over until, ultimately, lines of code and piece parts are identified. Agreement is reached at each level, and the decisions are placed under project configuration management before proceeding to the next level. When the lowest level is defined, we move upward through the integration and verification process on the right leg of the Vee to ultimately arrive at the complete verified and validated system. At each level there is a direct correlation between activities on the left and right sides of the Vee – the rationale for the shape. Everything on the left and right legs of the Vee are sequentially placed under configuration control, and hence this has been designated the “core” of the Vee.” (Forsberg and Mooz, 1998). Regarding the “V” model and its relation with the method A&S presented in Koskela and Kagioglou (2006), it is possible to argue that A&S provides the theoretical foundation for the “V” Model. A&S have been used by ancient Greek geometers and up till now it has been applied in different fields. Recently Koskela and Kagioglou have stimulated the discussion regarding its features (which includes for example, the start and end points of A&S and the use of decomposition, regression and transformation). Their discussion also includes its use within construction. Therefore, to state that A&S may provide a theoretical base for the “V” model is based on the fact that many of the six features of the A&S method can be observed within the “V” model. For instance, the use of logical forms of analysis as decomposition and regression. Concerning the set-base concurrent engineering (Sobek at al., 1989) approach, both methods have focus on the integration of the design and production processes aiming to avoid errors and to reduce waste. The core essence of set-based is allowing many options to move through the development funnel, so decisions about features are delayed as opposed to be decided at a particular phase. In the “V” model, despite decisions are made at particular phases, changes can be planned. The comparison at this point intends to state that the application of the “V” model can be expanded to different industries. Nevertheless, can the “V” model be applied in construction? It might be, considering that in construction, process models such as the Process Protocol developed by Kagioglou et al., (1998) may provide the sequence of the process, or the left “leg” of the “V”. Also, performance measurement techniques as the “Avis Technique” developed by CSTB (Centre Scientifique et Technique du Bâtiment) may provide verification and validation methods or the right “leg”. However, the integration of these two models has not been investigated in construction. To conclude, it seems that the “V” model or its constituent features can be generalised and then translated into useful tools or methods to be applied in construction. At least, the emphasis in reducing uncertainty at the beginning may establish meaning for reducing waste in lean design. As argued by Tzortzopoulos at al., (2006), to collect information at the beginning constitute a key element within complex healthcare construction projects. However whether or not different existing approaches in construction aligns with the “V” model or parts of it have not been investigated in construction. 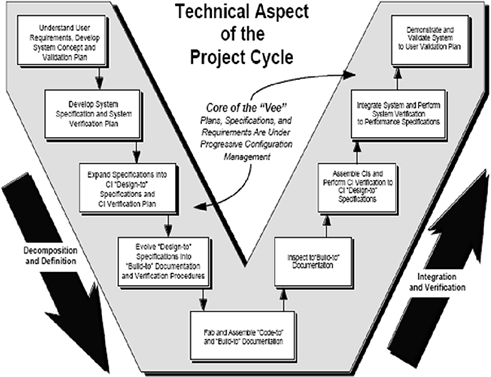 Forsberg, K; Mooz, H; & Cotterman, H; 1996, Visualizing Project Management, John Wiley &Sons, US. Koskela, L; & Kagioglou, M; (2006) The proto-theory of design: the method of analysis of the ancient geometers, International Design Conference - Design 2006, Dubrovnik - Croatia, May 15 - 18, 2006. Sobek II. D. K; Ward, A. C; & Liker, J.K; (1999) Toyota´s Principles of Set-Based Concurrent Engineering. loan Management Review, Cambridge, v. 40, p. 67-83. Kagioglou, M; Cooper, R; Aouad, G; Hinks, J; Sexton, M; & Sheath, D; (1998). “Final Report:Generic Design and Construction Process Protocol”. University of Salford, UK. Tzortzopoulos, P; Cooper, R; Chan, P; & Kagioglou, M. (2006) Clients’ activities at the design front-end. Design Studies, in press.